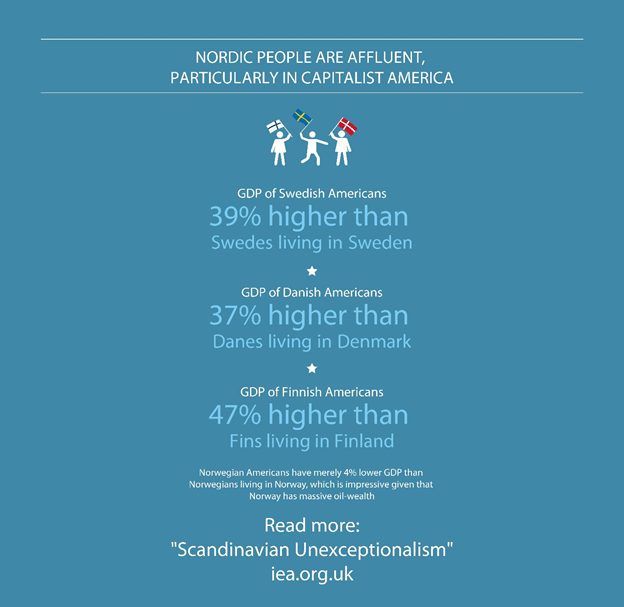 Comparing the United States and Nordic Nations: Is American “Inequality” Bad if It Simply Means Some People Get Richer Faster than other People Get Richer? I’ve already commented several times on the good and bad features of the Nordic Model, largely to correct the false narrative being advanced by Bernie Sanders (though I was writing on this issue well before the Vermont Senator decided to run for Chief Commissar President of the United States). In any event, Sanders is a self-proclaimed socialist and he says he wants to adopt Scandinavian policies in the United States because he thinks this will boost the poor. Yet he may want to check his premise. Warren Meyer of Coyote Blog looked at the numbers and concluded that poor people are not better off in Nordic countries. When folks like Bernie Sanders say that we have more income inequality than Sweden or Denmark, this is certainly true. …Sanders implies that this greater income equality means the poor are better off in these countries, he is very probably wrong. Because the data tends to show that while the middle class in the US is richer than the middle class in Denmark, and the rich in the US are richer than the rich in Denmark, the poor in the US are not poorer than those in Denmark. And isn’t this what we really care about? The absolute well-being of the poor? Regarding his rhetorical question, the answer may not be yes. As Margaret Thatcher famously observed, some statists resent the rich more than they care about the less fortunate. But the motives of the left is not our focus today. Instead, we want to know whether the poor are worse off in the U.S. than in Nordic nations. Meyer’s article seeks to measure living standards for different income classes in the United States and then compare them to living standards for different income classes in Denmark and Sweden. Meyer found some data on this issue from the Economic Policy Institute, the same source that I cited in my 2007 study on the Nordic Model (see Figure 9 on page 11). But he wanted to update and expand on that data. So he started digging. I used data from the LIS Cross-National Data Center. …the same data set used by several folks on the Left (John Cassidy and Kevin Drum) to highlight inequality issues… I then compared the US to several other countries, looking at the absolute well-being of folks at different income percentile levels. I have used both exchange rates and purchasing price parity (PPP) for the comparison. And what did Meyer discover? …all the way down to at least the 10th percentile poorest people, the poor in the US are as well or better off than the poor in Denmark and Sweden. And everyone else, including those at the 20th and 25th percentile we would still likely call “poor”, are way better off in the US. Here’s the data for Denmark. As you can see, the poor in both nations have similar levels of income, but all other income classes in the United States are better off than their Danish counterparts. And here’s the comparison of the United States and Sweden. Once again, it’s very clear that America’s smaller overall burden of government generates more prosperity. So here’s the bottom line. If you’re a poor person in America, your income is as high as the incomes of your counterparts in Scandinavia. But you have a much better chance of out-earning your foreign counterparts if you begin the climb the economic ladder. Yes, that means more “inequality,” but that’s why the term is meaningless. By the standards of any normal and rational person, the US system is producing better outcomes. 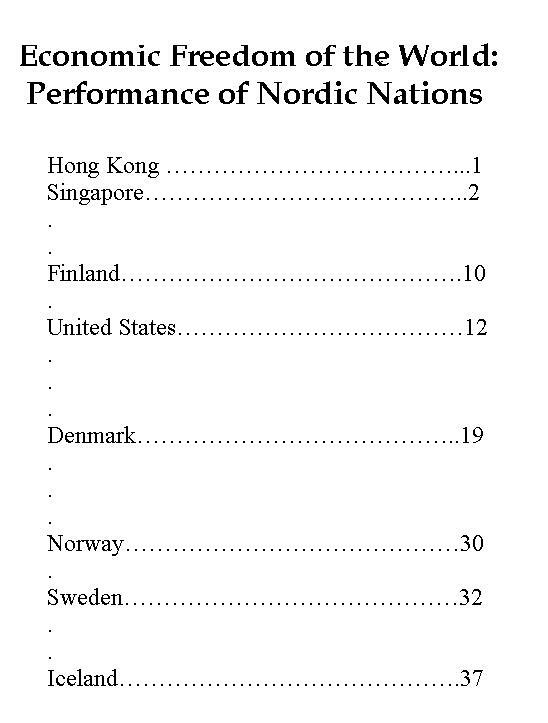 Now that we’ve ascertained that the United States is more prosperous than Nordic nations, let’s now say something nice about those countries by defending them against the scurrilous accusation that they follow socialist policies. I’ve already shared my two cents on this issue, pointing out that neither Bernie Sanders nor Scandinavian nations properly can be considered socialist. But if you don’t believe me, maybe you’ll believe the Prime Minister of Denmark, as reported by Vox. The key statement from the Prime Minister is that Denmark is not a “planned economy,” because that is what you automatically get when the government is in charge of allocating resources and controlling the means of production. But since that doesn’t happen in Denmark, Mr. Rasmussen is exactly right that his country isn’t socialist. It’s high tax, and that’s not good. There’s a huge amount of dependency on government because of redistribution programs, and that’s also not good. But a high-tax welfare state is not the same as socialism. Indeed, nations such as Denmark and Sweden would be somewhere in between France and the United States on my statism spectrum. By the way, don’t let anyone get away with claiming that Scandinavian nations somehow prove that big government isn’t an obstacle to a country becoming rich. 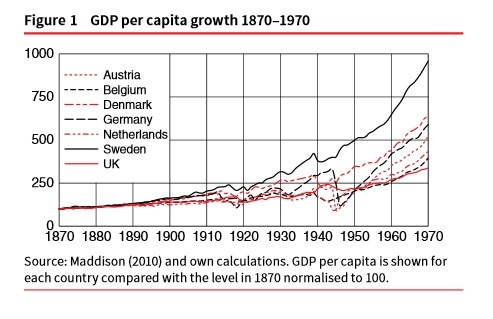 Yes, Nordic countries are rich by world standards, but the key thing to understand is that they became prosperous in the late 1800s and early 1900s, back when government was very small. 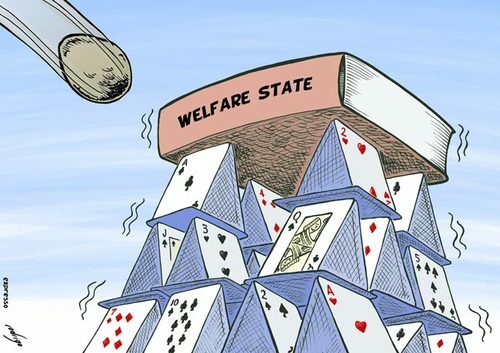 It wasn’t until the 1960s that nations such as Denmark and Sweden adopted big welfare states. And, not coincidentally, that’s when economic growth slowed in those countries. Whenever there’s a discussion of the Nordic nations, I feel conflicted. I don’t like the punitively high tax rates and socially destructive levels of redistribution in nations such as Denmark, but I also admire the very laissez-faire policies those countries have when it comes to regulation, trade, and property rights. Indeed, on those latter issues, it’s worth noting that Nordic nations are more free market-oriented than the United States according to the experts at the Fraser Institute who put together Economic Freedom of the World. Take the example of Sweden. That country has robust school choice and a partially privatized social security system. Moreover, Nordic nations in general have lower business tax burdens and investment tax burdens than the United States. And Denmark and Sweden have both taken some modest steps to restrain government spending, so even in the realm of fiscal policy you can find some admirable developments. But these countries need more than “modest steps” since the burden of government spending is still enormous. And excessive social-welfare expenditures are a major problem since such outlays depress labor force participation and encourage dependency. I mention all these good and bad features of Nordic nations because Senator Bernie Sanders has suggested, as part of his presidential campaign, that the United States should become more like Sweden and Denmark. If I got to pick and choose which policies we copied, I would agree. But since Senator Sanders almost surely wants us to copy their fiscal policies (and presumably has no idea that those countries are pro-free market in other areas), I feel compelled to explain that he’s wrong. And the good news is that other people are producing the evidence, which makes my job easy. Nima Sanandaji is a Swedish economist who just wrote a very illuminating article on this topic for the Cayman Financial Review. He starts by noting how statists embrace the Nordic Model. Denmark, Finland, Norway and Sweden have high-tax social democratic systems that for long have been admired by the left. …The high regard comes as no surprise. Nordic societies are uniquely successful. Not only are they characterised by high living standards, but also by other attractive features such as low crime rates, long life expectations, high degrees of social cohesion and relatively even income distributions. …This is often seen as proof that a ”third way” policy between socialism and capitalism works well, and that other societies can reach the same favourable social outcomes simply by expanding the size of government. But Nima explains that Nordic nations became rich when they had free markets and small government. The best that can be said about the Nordic welfare state is that the damage is somewhat contained because of cultural norms. If one studies Nordic history and society in depth, however, it quickly becomes evident that the simplistic analysis is flawed. …High levels of trust, strong work ethic, civic participation, social cohesion, individual responsibility and family values are long-standing features of Nordic society that pre-date the welfare state. These deeper social institutions explain why Sweden, Denmark and Norway could so quickly grow from impoverished nations to wealthy ones as industrialisation and the market economy were introduced in the late 19th century. …The same norms explain why large welfare systems could be implemented in the mid-20th century. Strong work ethics and high levels of trust made it possible to levy high taxes and offer generous benefits with limited risk of abuse and undesirable incentive effects. It is important to stress that the direction of causality seems to be from cultures with strong social capital towards welfare states that have not had serious adverse consequences, and not the other way around. Dr. Sanandaji then hypothesizes that we can learn a lot by comparing Americans of Nordic descent with those that didn’t emigrate. …the Nordic success culture is maintained when people from this region move abroad. …The American descendants of Nordic migrants live in a very different policy environment compared with the residents of the Nordic countries. The former live in an environment with less welfare, lower taxes and (in general) freer markets. Interestingly, the social and economic success of Nordic-Americans is on a par with or even better than their cousins in the Nordic countries. …Close to 12 million Americans have Nordic (Scandinavian) origins. And he produces some dramatic data. Simply said, people of Nordic descent do very well in America, where the fiscal burden is lower than it is back in Scandinavia. According to the 2010 US Census, the median household income in the United States is $51,914. This can be compared with a median household income of $61,920 for Danish Americans, $59,379 for Finish-Americans, $60,935 for Norwegian Americans and $61,549 for Swedish Americans. There is also a group identifying themselves simply as “Scandinavian Americans” in the US Census. The median household income for this group is even higher at $66,219. But here’s the most remarkable information from his article. Nordic-Americans are far more productive than their cousins back home. Danish Americans have a contribution to GDP per capita 37 per cent higher than Danes still living in Denmark; Swedish Americans contribute 39 per cent more to GDP per capita than Swedes living in Sweden; and Finnish Americans contribute 47 per cent more than Finns living in Finland. …there is prima facie evidence that the decedents of Nordic people who move to the U.S. are significantly better off than those who stay at home. Here’s the infographic Nima sent with his article. Wow, this is game, set, match, as far as I’m concerned. Nima produced similar data a few years ago looking just as Swedes. But this new data makes it clear that we’re not just looking at a one-nation phenomenon. The lesson is clear. 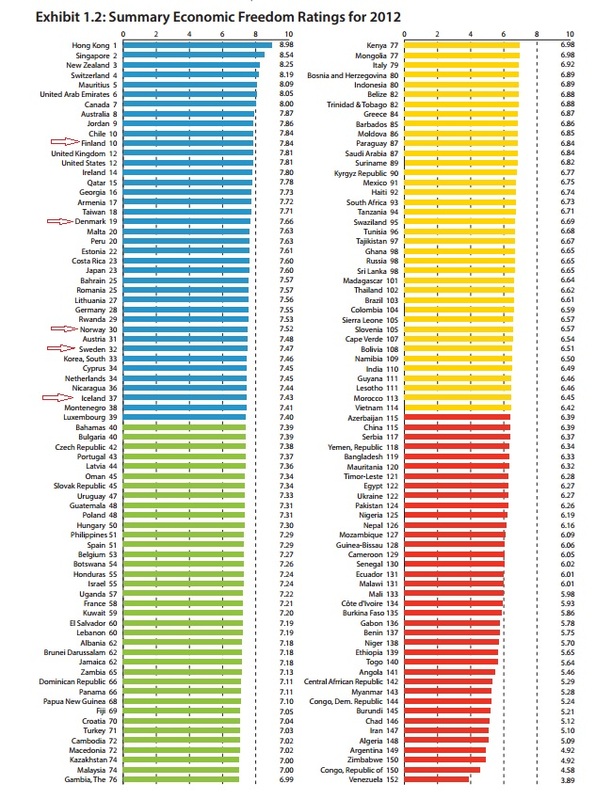 Nordic people manage to be somewhat productive in high-tax, big-government nations. But if they reside in a medium-tax country with a medium-sized government, they are highly productive (so just imagine what they could achieve in Hong Kong or Singapore!). And Nima also points out that there is less poverty among Scandinavians in America than there is among Scandinavians in Scandinavia. Nordic descendants in the U.S. today have half the poverty rate of the average of Americans – a consistent finding for decades. In other words, Nordic Americans have lower poverty rates than Nordic citizens. So here’s the lesson that will be a nightmare for Bernie Sanders. It turns out that his role models actually teach us that big government makes people less prosperous. …in the long run, the large welfare states have eroded incentives, and ultimately the social norms that bounded Nordic societies together. The U.S. system, with greater emphasis on personal responsibility, is more in line with the traditional Nordic system that allowed for the culture of success to develop in the first place. Thus, we should not be surprised that Nordic Americans have both higher living standard and lower poverty than their cousins in the Nordic welfare states. To summarize, the recipe for prosperity is free markets (which you find in Scandinavia) and small government (which is absent in those countries). But Senator Sanders wants to copy the bad parts of Nordic nations while ignoring the good parts. For those who care about real-world evidence, Dr. Sanandaji’s data suggests we should take the opposite approach. There’s an old saying that there’s no such thing as bad publicity. That may be true if you’re in Hollywood and visibility is a key to long-run earnings. But in the world of public policy, you don’t want to be a punching bag. And that describes my role in a book excerpt just published by Salon. Jordan Ellenberg, a mathematics professor at the University of Wisconsin, has decided that I’m a “linear” thinker. Here are some excerpts from the article, starting with his perception of my view on the appropriate size of government, presumably culled from this blog post. Daniel J. Mitchell of the libertarian Cato Institute posted a blog entry with the provocative title: “Why Is Obama Trying to Make America More Like Sweden when Swedes Are Trying to Be Less Like Sweden?” Good question! When you put it that way, it does seem pretty perverse. …Here’s what the world looks like to the Cato Institute… Don’t worry about exactly how we’re quantifying these things. 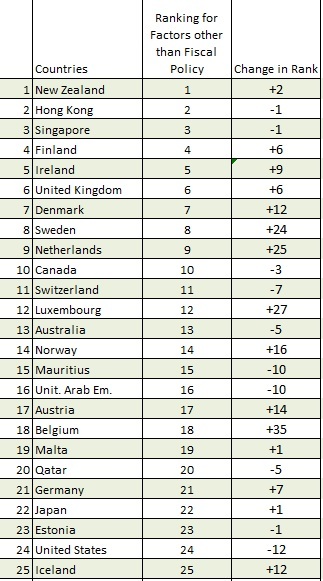 The point is just this: according to the chart, the more Swedish you are, the worse off your country is. The Swedes, no fools, have figured this out and are launching their northwestward climb toward free-market prosperity. I confess that he presents a clever and amusing caricature of my views. My ideal world of small government and free markets would be a Libertopia, whereas total statism could be characterized as the Black Pit of Socialism. But Ellenberg’s goal isn’t to merely describe my philosophical yearnings and policy positions. He wants to discredit my viewpoint. So he suggests an alternative way of looking at the world. Let me draw the same picture from the point of view of people whose economic views are closer to President Obama’s… This picture gives very different advice about how Swedish we should be. Where do we find peak prosperity? At a point more Swedish than America, but less Swedish than Sweden. If this picture is right, it makes perfect sense for Obama to beef up our welfare state while the Swedes trim theirs down. He elaborates, emphasizing the importance of nonlinear thinking. The difference between the two pictures is the difference between linearity and nonlinearity… The Cato curve is a line; the non-Cato curve, the one with the hump in the middle, is not. …thinking nonlinearly is crucial, because not all curves are lines. A moment of reflection will tell you that the real curves of economics look like the second picture, not the first. They’re nonlinear. 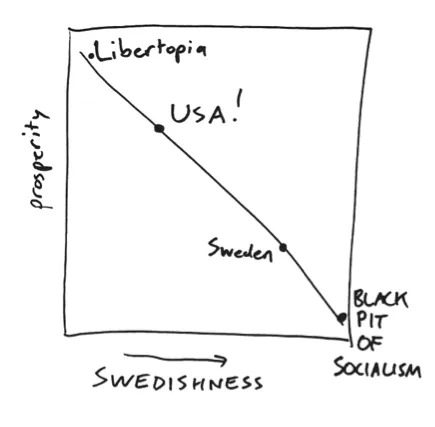 Mitchell’s reasoning is an example of false linearity—he’s assuming, without coming right out and saying so, that the course of prosperity is described by the line segment in the first picture, in which case Sweden stripping down its social infrastructure means we should do the same. …you know the linear picture is wrong. Some principle more complicated than “More government bad, less government good” is in effect. …Nonlinear thinking means which way you should go depends on where you already are. Ellenberg then points out, citing the Laffer Curve, that “the folks at Cato used to understand” the importance of nonlinear analysis. The irony is that economic conservatives like the folks at Cato used to understand this better than anybody. That second picture I drew up there? …I am not the first person to draw it. It’s called the Laffer curve, and it’s played a central role in Republican economics for almost forty years… if the government vacuums up every cent of the wage you’re paid to show up and teach school, or sell hardware, or middle-manage, why bother doing it? Over on the right edge of the graph, people don’t work at all. Or, if they work, they do so in informal economic niches where the tax collector’s hand can’t reach. The government’s revenue is zero… the curve recording the relationship between tax rate and government revenue cannot be a straight line. So what’s the bottom line? Am I a linear buffoon, as Ellenberg suggests? Well, it’s possible I’m a buffoon in some regards, but it’s not correct to pigeonhole me as a simple-minded linear thinker. At least not if the debate is about the proper size of government. I make this self-serving claim for the simple reason that I’m a big proponents of the Rahn Curve, which is …drum roll please… a nonlinear way of looking at the relationship between the size of government and economic performance. And just in case you think I’m prevaricating, here’s a depiction of the Rahn Curve that was excerpted from my video on that specific topic. Moreover, if you click on Rahn Curve category of my blog, you’ll find about 20 posts on the topic. And if you type “Rahn Curve” in the search box, you’ll find about twice as many mentions. So why didn’t Ellenberg notice any of this research? Beats the heck out of me. Perhaps he made a linear assumption about a supposed lack of nonlinear thinking among libertarians. In any event, here’s my video on the Rahn Curve so you can judge for yourself. And if you want information on the topic, here’s a video from Canada and here’s a video from the United Kingdom. P.S. I would argue that both the United States and Sweden are on the downward-sloping portion of the Rahn Curve, which is sort of what Ellenberg displays on his first graph. Had he been more thorough in his research, though, he would have discovered that I think growth is maximized when the public sector consumes about 10 percent of GDP. P.P.S. 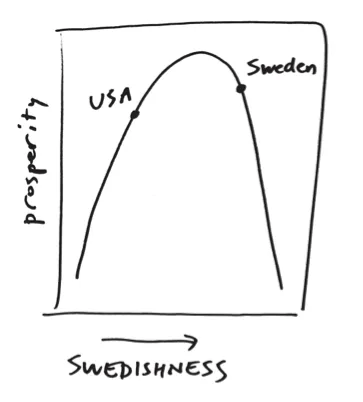 Ellenberg’s second chart puts the U.S. and Sweden at the same level of prosperity. Indeed, it looks like Sweden is a bit higher. That’s certainly not what we see in the international data on living standards. Moreover, Ellenberg may want to apply some nonlinear thinking to the data showing that Swedes in America earn a lot more than Swedes still living in Sweden.